This is a static data provider that downloads historical daily and hourly OHLCV data for cryptocurrencies like Bitcoin and their cross rates. Currently it uses an API gracefully provided for free by Cryptocompare. Whatever "coins" are listed on the Cryptocompare website can be downloaded by the provider. 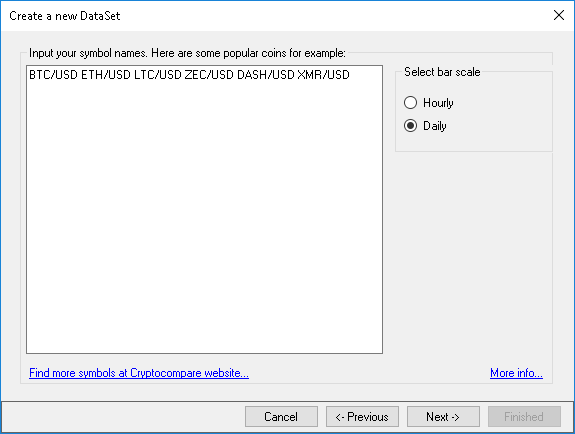 The New DataSet Wizard page comes with a preset of top cryptocurrencies for a quick start: Bitcoin (BTC/USD), Ethereum (ETH/USD), Litecoin (LTC/USD), ZCash (ZEC/USD), DigitalCash (DASH/USD) and Monero (XMR/USD). To be recognized by the provider, your coin symbol must have a slash "/" symbol. The convention is similar to Forex: put your coin symbol before the slash and use the part after the slash to indicate the currency your coin will be calculated in. 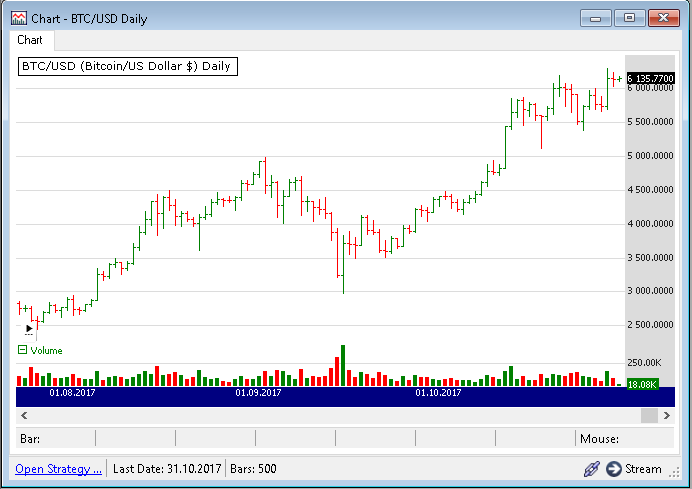 Like the proverbial EUR/USD would be the symbol for trading Euros that are calculated in US dollars, like the Cryptocurrency provider will return the chart of Bitcoin trading in USD if you enter BTC/USD as the symbol. Much like in Forex, the opposite is true: USD/BTC is a valid symbol example (where the currency is Bitcoin, not the dollar). Provider also supports cross rates e.g. ETH/BTC (Ethereum to Bitcoin ratio). The Volume is represented in the base currency that coins are traded into. Although cryptocurrencies normally trade in fractions, Wealth-Lab does not support fractional shares so volume is displayed in integer numbers. This rounding shouldn't be serious limitation considering turnover in the top coins, though. If you get 169 bars when updating an Hourly symbol for the first time, this is probably a bug in their API. Workaround: do the initial update like this: leave just one symbol in the DataSet, update, modify the DataSet to hold another symbol, update etc.